Is Your Social Media Policy Against the Law? Social media policies can be unlawful. In 1935, Congress enacted the National Labor Relations Act to protect the rights of employees, encourage collective bargaining and curtail dangerous workplace policies. Today, when an employee in the US believes they have been wrongfully terminated they notify the National Labor Relations Board, which has local offices nationwide. Over the past 18 months, the NLRB has released a series of memos on the lawfulness of corporate social media policies. The memos found most corporate social media policies to be overly broad and unlawful. One of the most common offenses was restricting employee’s from discussing “confidential information” such as wages and working conditions with co-workers on social media. This month, the Board issued their first decision on social media policies, striking down Costco’s rules and regulations as unlawful. (d) employees are prohibited from sharing “confidential” information such as employees’ names, addresses, telephone numbers, and email addresses. Here’s the deal. If a work rule has the potential to reasonably chill an employee’s right to organize or bargain collectively, it’s unlawful. Employees have the right to complain publicly if they think their employers’ labor practices are unfair. So if I complain on Linkedin that someone else is making more than me, and it’s unfair, that’s a protected activity. If you fire me for disclosing confidential salary information, you’re going to lose in court. It’s as simple as that, and if your social media policy prohibits it, you are opening your company up to a NLRB action. You don’t have to reference the National Labor Relations Act to violate it. If your social media policy uses language that restricts employees from using social media to “damage the Company, defame any individual or damage any person’s reputation” the NLRB sees it as restricting labor’s protected rights, because that social media policy it could have a chilling effect on what is seen a free speech issue. On the other hand, if the retrictions are subordinated to a clause on sexual misconduct or racial harrassment it would be allowed, since employees would be able to appreciate the rule in context. It’s the overly broad restrictions (often wrapped into social media policy) that the Board opposes. The best social media policies will be more exacting in their language. 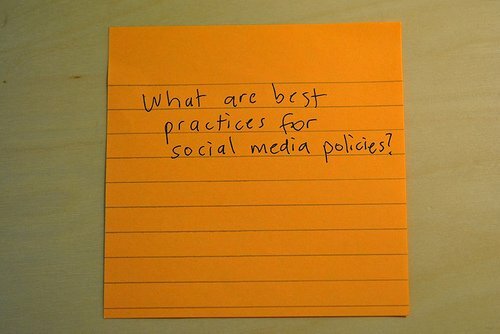 Here’s my online course on social media policy development, if you’d like some pointers on what employers should be thinking about when they draft their policies. But even a good policy isn’t enough. You need to educate your comployees and ongoing social media training is the best way to get it done. Eric Schwartzman is founder of social media training provider Comply Socially and producer of the FTC Social Media Disclosure & Transparency Certification Program.